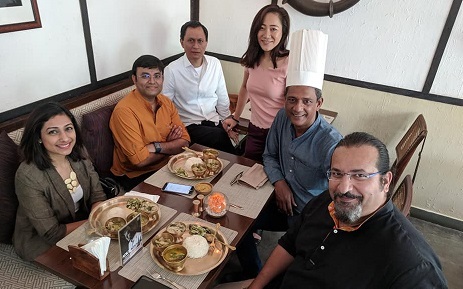 Assam’s very own son of the soil, Adil Hussain, who has been creating waves in world cinema by his inimitable acting style, has donned the chef’s cap for a change. Adil will cook some of his select dishes for equally select and distinguished guests at the Sikkimese restaurant, Nimtho, in New Delhi on February 16. The actor, who is a passionate cook himself, will cook and converse with guests at the Sikkimese restaurant from 1 pm to 4 pm. The tickets for the second session of ‘Curries & Conversations with Adil’ will be available from Saturday. A successful first session of ‘Curries & Conversation with Adil’ was held in the month of September last year at Nimtho, where the actor cooked various types of cuisines for the guests and also engaged in conversation with them. The actor who was seen having dinner with Tabu in the movie Life of Pie, breakfast with Sridevi in the movie English Vinglish or lunch with Vidya Balan in the movie Ishqiya, is a successful celebrity chef himself. Most of the friends of the actor also believe him to be a great cook. Nimtho is famous for serving organic food and various traditional dishes of Sikkim. The restaurant was founded on November 24, 2017.